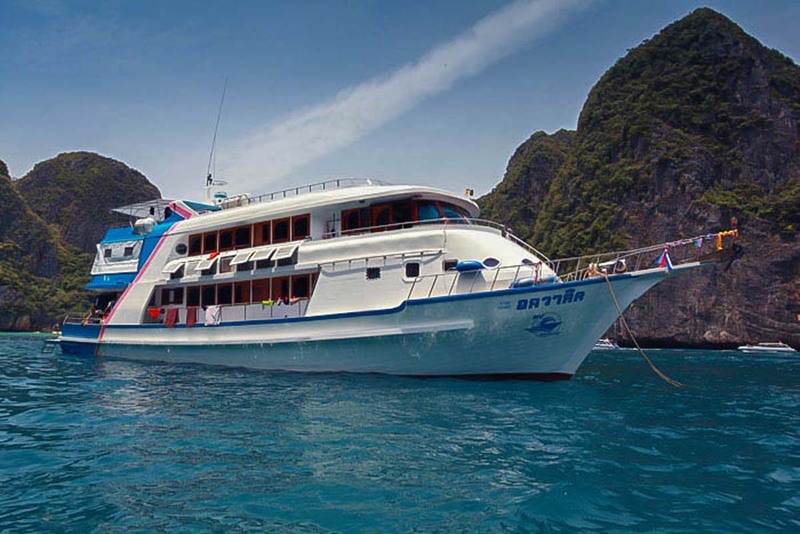 Manta Queen 8 is a newly-renovated scuba diving liveaboard boat offering affordable-luxury Similan scuba diving liveaboard trips. 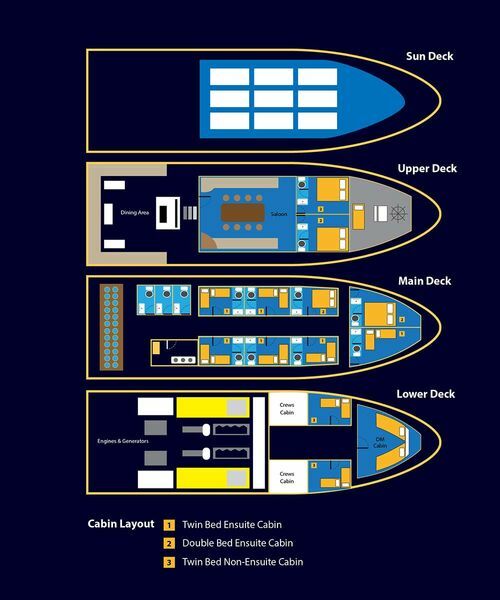 There are 3 cabin types, which are twin & double cabins on the upper decks. These have private bathrooms and lots of space inside. There are also two twin cabins on the lower deck which share a bathroom. The boat is already well established in the Similan Islands, and a favourite among the dive staff. 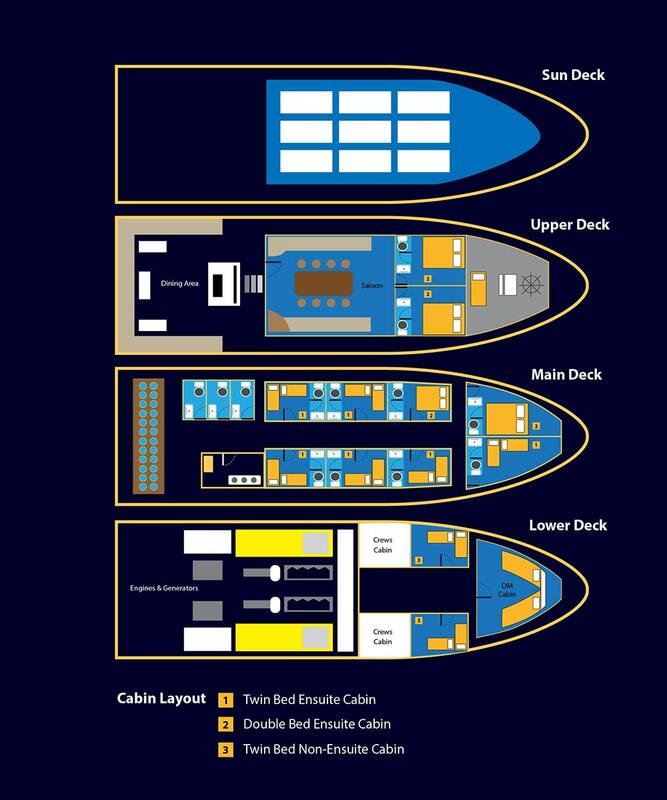 Its size, design, facilities and cabins enable everyone to feel comfortable. Added to that is great food, service and value, and this boat is an instant success. Most MQ8 trips are fully booked, mainly due to the luxury and space available for the low prices. Now, MQ8 also has free Wi-Fi, when in range. 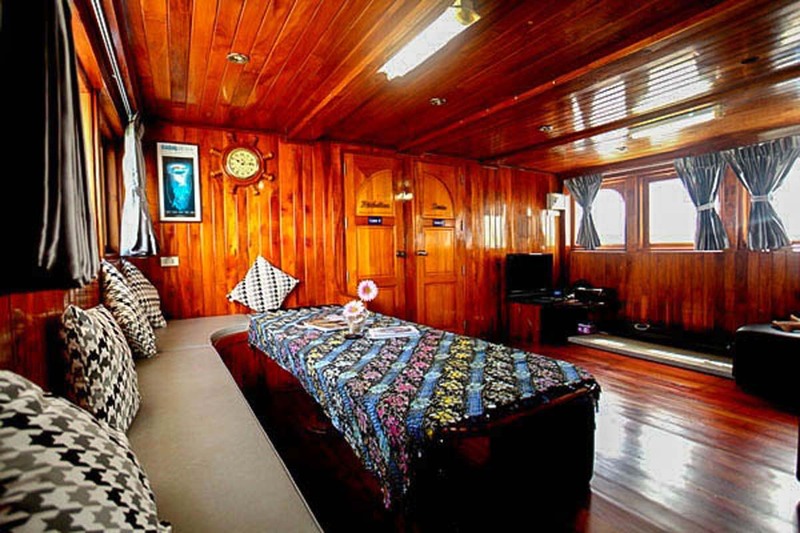 This Similan liveaboard sails from Khao Lak’s Tab Lamu Pier in the evening of departure day, and you wake up the following morning already at the Similan Islands. Manta Queen 8 trips are 4D/4N in length with 15 wonderful dives. 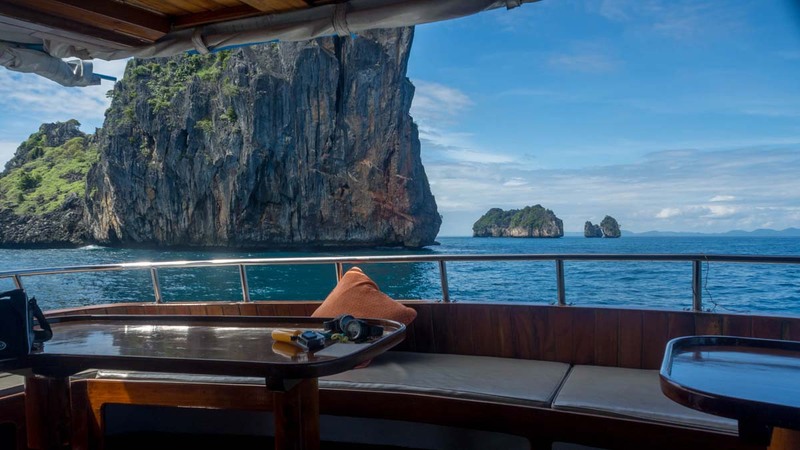 The trips start at an easy dive site in the central Similan Islands, then the boat works its way north to Koh Bon, Koh Tachai and Richelieu Rock. On the final day of the trip, it usually visits Koh bon again and then a couple of local shipwrecks. A few misleading websites claim the trips are 5d/4N, which is incorrect. 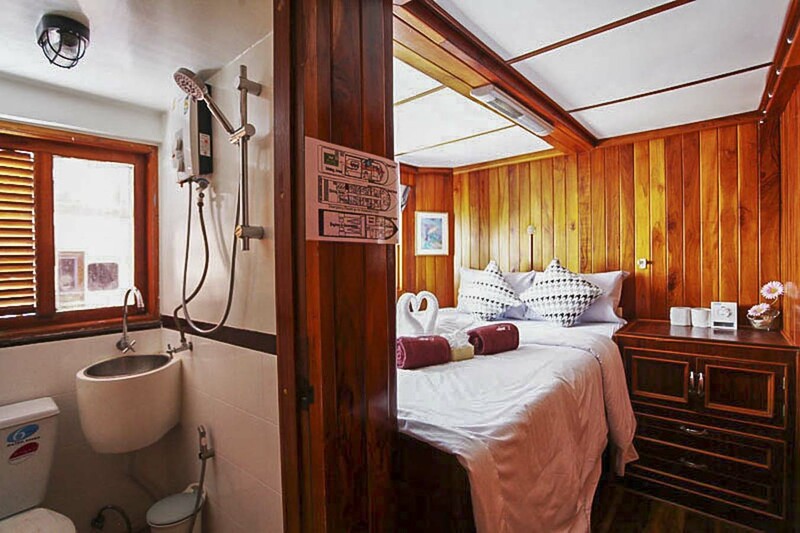 In addition to the large and comfortable guest cabins, Manta Queen 8 has plenty of communal areas where you can relax alone or socialise. These include the large partially-shaded sundeck and a dining area which has plenty of seating and tables. Most guests spend a lot of non-diving time here. There is also an air-conditioned lounge saloon. 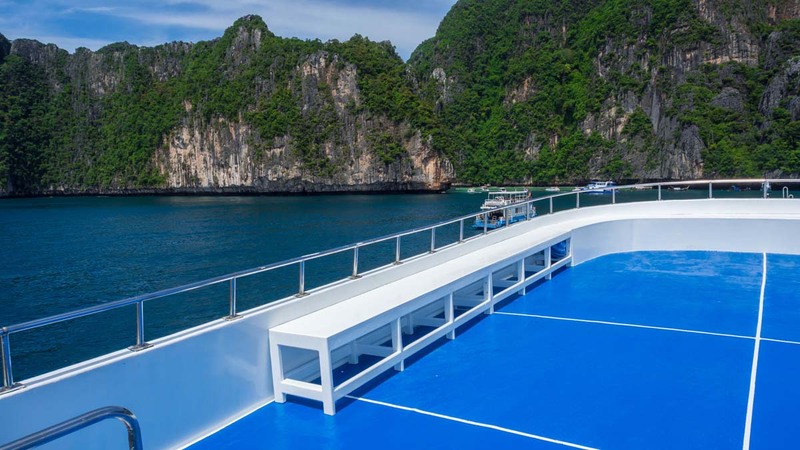 For diving, the boat has a dive platform easily large enough for every diver to store equipment and to take the ‘giant stride’ from. Tender dinghies can collect divers who surface away from the boat or near the reef, as well as transport anyone to the beaches during the trip. Manta Queen 8 departs from Tab Lamu Pier in Khao Lak for 4 days & 4 nights. You arrive at the dive centre in the afternoon for check-in. 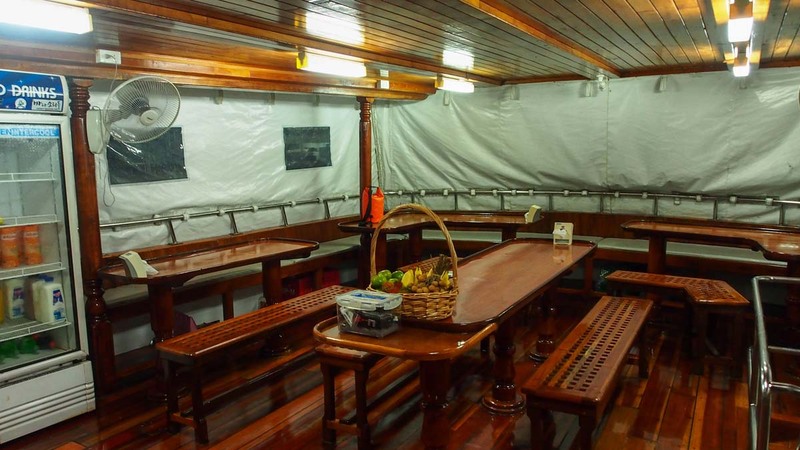 A light evening meal is served on board, and the diving starts early the next morning. Please click below for a detailed itinerary. Beware that some other websites claim Manta Queen 8's trips are 5D/4N but this is incorrect and misleading. Do not trust them. Engines: 2x Cummins 315 Hp 10 Cylinder. Generators: 2x 50 KW, 1 X 20 KW. Crusining Speed: 9 - 10 Knots. Instrumentation: PS Sat. Navigation, Sonar, Compass. Safety: VHF/FM Mobile Marine, Emergency 02, Liferaft, Lifejakets. 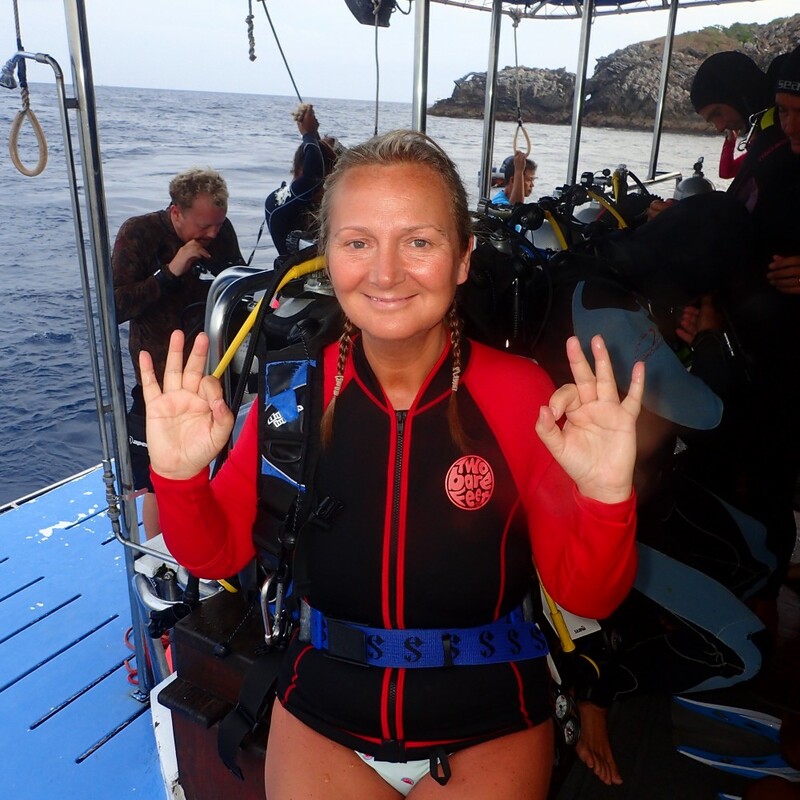 PADI courses are available on Manta Queen 8. You can decide on your course when you arrive, but it's much better to let us know before you come because pre-booking your PADI course ensures that the staff and material will be perpared. New divers who want to become certified as Open Water divers on Manta Queen 8 need to arrive at least one full day before departure. This is necessary to complete the theory, tests and skills in the pool. There is normally a surcharge for staff if you are the only one or two doing the Open Water course. Manta Queen 8 guests can choose from cheap or free pick ups, or arrive at the dive centre in Khao Lak by themselves. Coming from Phuket you pay just 300 THB to join the scheduled pick ups which start at 11.30am and continue through afternoon. Pick ups from Phuket airport are 3.00-3.30pm. Khao Lak guests can be picked up for free at 4.00-4.30pm. At the end of the trips, guests can return to Khao Lak for free or to Phuket for 300 THB. Departure from the dive centre in Khao Lak is usually around 5.00pm. Everyone needs to pay a fee to enter and dive in the national marine parks. this is paid when you check in at the dive centre on departure day. Equipment rental fees and any other extras are paid at the dive centre when you check in. Credit card payments incur a fee of 3%, but there is an ATM at the dive centre and there are plenty of banks and money changers just a short walk away. Extra equipment is organised, fitted and paid for at the dive centre on departure day.